I am currently one of those consultants working in a large organization that is trying to implement Agile. 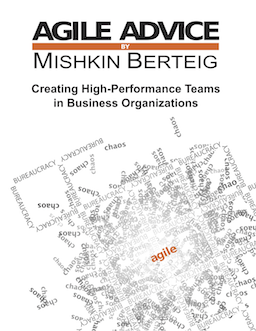 Without a doubt there is huge, mostly unconscious, resistance to the cultural change that Agile requires of a highly-regulated command and control organization. Yet even with that, introducing a few simple agile practices in a reasonable fashion such as iterative delivery, daily status for self-organization, colocated teams and a few information radiators has made a huge difference in teams’ ability to deliver and in their satisfaction with their work. The jury is still out about this change at this organization: will it be permanent? or will it be another fad? or will it remain a weak version of agile? Like almost any idealistic movement, Agile cannot succeed in the short term. People’s hearts need to be transformed, their habits changed and their thoughts changed. This can happen quickly for some, but for most it is a long process often preceded by the pain of doing things badly. For the most part, Agile is a movement that is being driven by the grassroots: folks in IT who see it as the better way. However, even if every programmer and project manager in an organization decideds that Agile is the way to go, it could still fail before it wins. The corporate culture change required to fully adopt agile can take years and years and can be scuttled at any time by the whim of those in power. If that happens, some of those folks who wanted Agile will become cynical and immunized to the idealistic pull of Agile. The faster we go, the less patience we have, the more people will become immunized. The attraction of the financial side of things for consulting, training, publishing, all threaten to poison our community. In the Baha’i Community, to which I belong, our religious laws prohibit “professional” Baha’is. The mix of money with an ideal would destroy the goals of our community: peace, unity. Of course, that means it takes hundreds of years if not thousands to build our capacity, to demonstrate to others the bounties we have to offer. In the Agile community, like in many other places, there is no sense that this is a movement to span hundreds of years, nor even decades. It is a young set of ideas and has only been visible for six or seven years. We don’t have the patience to wait decades, partly because we are excited, but also partly because we all need to earn a living and I don’t think any of us really want to be economic martyrs to the cause of Agile. Nevertheless, sometimes we do have to have courage and walk away from a bad deal. Thanks for Tobias Mayer for a message on the ScrumDevelopment Yahoo! group. That message inspired this one.